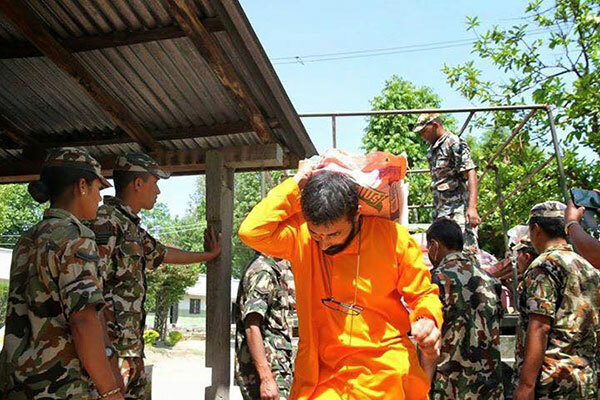 Kavre was one of the most affected districts, so much so that in the first photo you can see Shri. 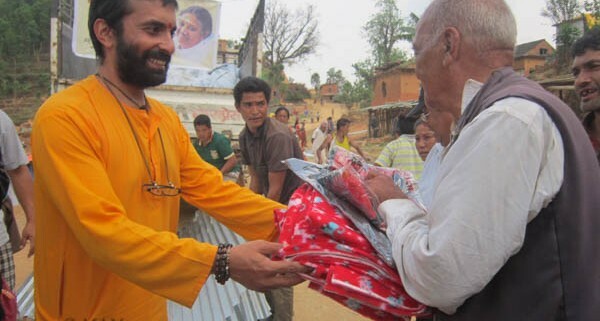 Upareti ex-Labour Minister of Nepal receiving blankets and windcheaters and afterwards tin sheets from us. His houses in the village were totally devastated. He was so moved by our help that he declared that he would come to Kerala to express his gratitude to Amma for helping in this hour of need. Again, even before we packed and left for the next village people had already started using the tin sheets as roofing over makeshift bamboo frames they had put up. 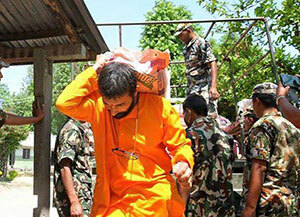 The next place we covered was Kudari Gaon in which hundreds of affected had been shortlisted to receive aid from us. The villagers were very grateful to us and honoured our representatives with scarves as is the local custom. The Hon’ble Prime Minster welcomed Amma’s international organisation to Nepal and requested to continue its relief and rehabilitation activities in affected areas of Nepal. We received a plea from some villages in Melamchi in Sindhupal Chowk asking for help as very little help was reaching them. By this time tarpaulins were simply not available in Nepal so it was being sourced through India from where it could take anything between a week or ten days for it to get to us. And then the extra time required for carting it to the villages. So rather than wait for so long to meet a need which was so urgent, we decided to provide tin sheets which would serve both as a temporary shelter and could be used for roofing when they were able to build a house. We were able to provide the best quality tin sheets and sacks of rice, cooking oil, good quality wind cheaters and blankets to villagers in these areas. 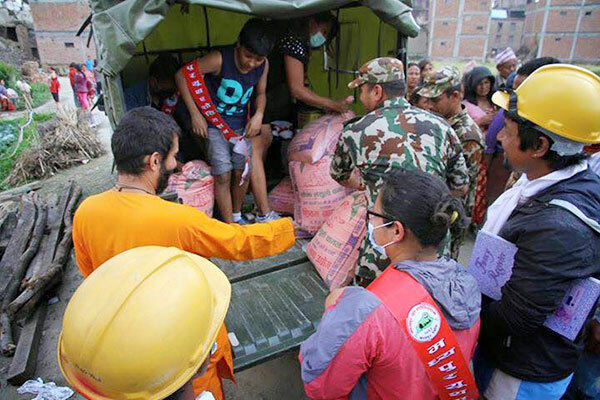 In the initial days of the Nepal Earthquake, we were able to extend help to our brothers and sisters in Bhaktapur, Sindhupal Chowk and Kavre districts. 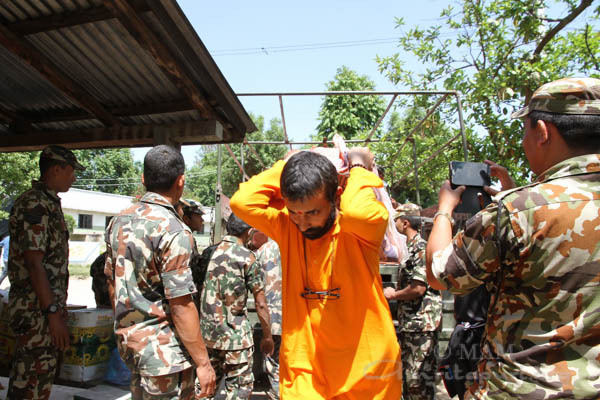 With the help of the Nepalese army as well as local youth clubs, the ashram volunteers were able to reach out to a huge number of affected people. 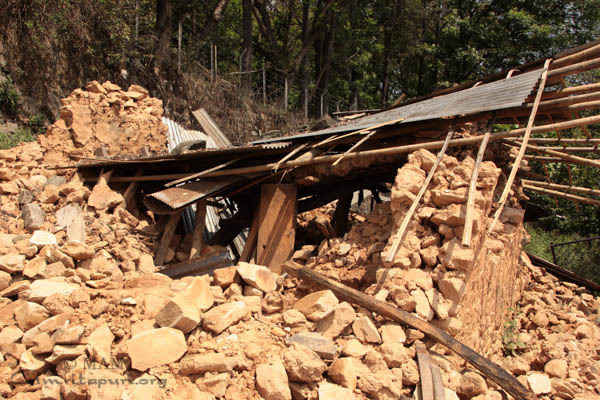 Tracts of Bhaktapur looks like a war zone with whole building blocks razed to the ground. It was saddening to see the army digging for bodies on one side as the displaced survivors rummaged in the rubble trying to scavenge what little food or furniture or building materials they could. Death on one side and an endless urge to live and survive on the other – seemed to sum up the human condition. The army personnel helped in everything – from purchase of the materials, to stock maintenance and then finally disbursement as per needs to the different refugee camps. We were able to provide Rice, Dal, Cooking Oil, Soap, and even biscuits for children in these camps. Hundreds of families were benefitted here. 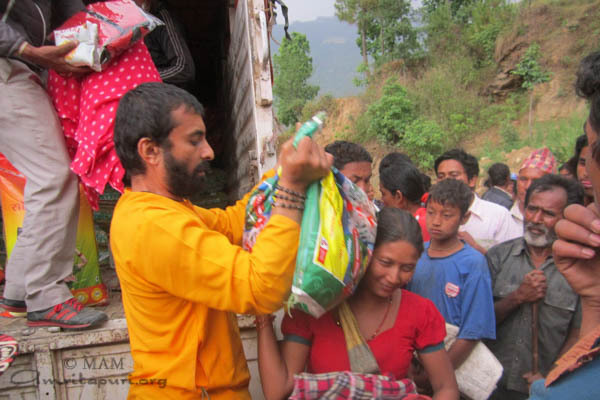 The people were very grateful especially as they learnt that ashram situated in Kerala was extending help to them in Nepal. 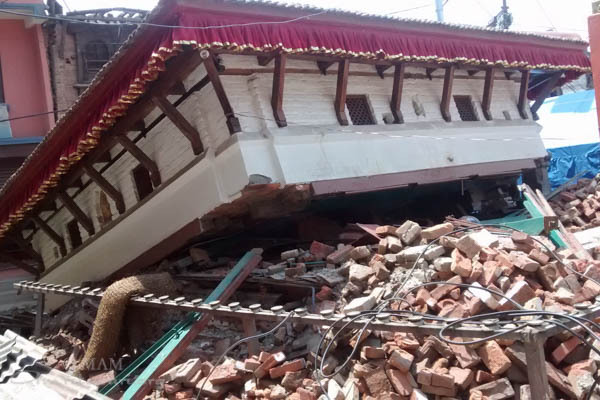 In the wake of the devastating earthquake in Nepal the Mata Amritanandamayi Math was also there to come forward with an offer to help. 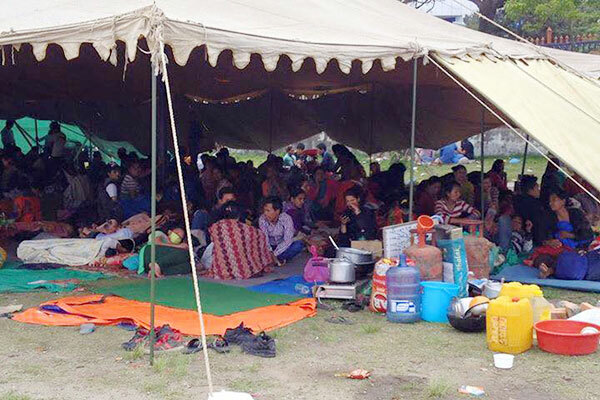 Amma immediately sent representatives to Nepal to assess the situation and help in whatever way possible. 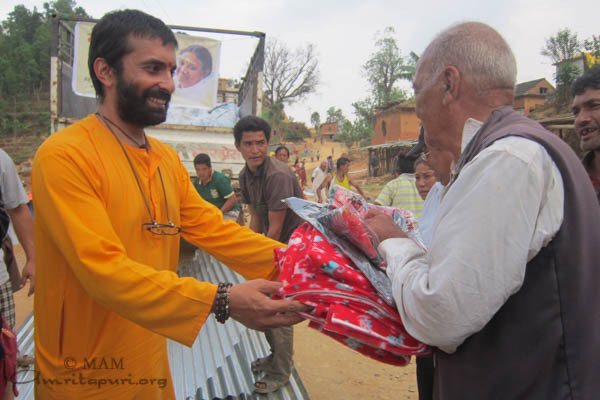 The Math was engaged in providing basic provisions – Rice, Dal, Clothing, Blankets, etc. 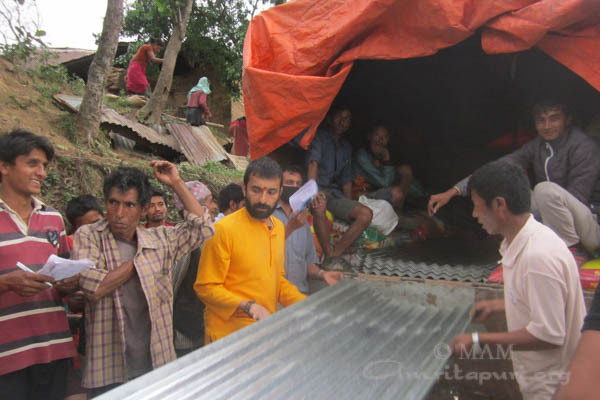 Seeing that the devastation had made many in the villages homeless, the Math was engaged in distribution of tin sheets for roofing – with an aim to providing temporary shelter, which could later be used as part of their permanent housing too. In the last few days Amma’s ashram has provided 1,00,000 Tetanus Toxoid vaccines and tons of medicines. Due to the thousands injured, the need for the Anti-Tetanus Toxoid vaccine was strongly felt. The need and scarcity of vaccine were also voiced within the medical circles. The vaccine is not only crucial for those directly injured but equally important for the post-disaster period, where injuries from collapsed debris pose new threats for adults and children alike. In response to this urgent need, Mata Amritanandamayi Math organised 1,00,000 doses of ATT vaccine to be urgently sent to Kathmandu by air from Malaysia. Ms. Mridula Koirala, Special Advisor to the Prime Minister accepted the consignment on behalf of the Hon’ble Prime Minister. Thus far, this is the single largest supply of ATT vaccine provided by any aid organization since the earthquake struck. Apart from the vaccine, the Math has donated two tons of essential medicines and surgical items to the Bir Hospital, the biggest Govt. Hospital in Nepal. The supplies were received by the Hospital Director, Prof. Dr Swoyam Prakash Pandit in the presence of Ms. Mridula Koirala. The Director thanked Amma for sending the critical vaccine and the other medicines at the most needed hour. 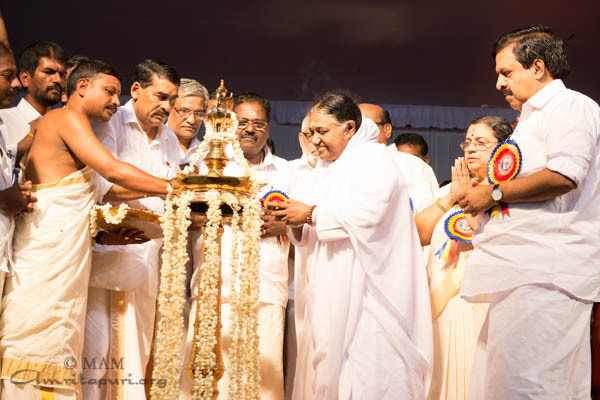 Over the years, the Mata Amritanandamayi Math has been effectively helping in post-disaster situations. Starting from the earthquake in Lattur Maharashtra, the Math was one of the biggest agencies post-tsunami to render immediate aid in the form of temporary shelters, food, clothing, etc. to long-term solutions like housing, vocational training etc. After the natural calamity in Uttarakhand, the Math is still active there helping rebuild houses, schools, colleges and providing vocational training, empowering women and tablet-aided learning for children. The second successful double hands transplant in India was carried out in Amrita Institute of Medical Sciences, Kochi on 10th April 2015. The recipient of this bilateral hand transplant is Abdul Rahim a 30 year old Captain in Afghanistan border security force. He lost both his hand while attempting to diffuse mines as a part of his duty three years back. Abdul Rahim had been waiting for last four months in Kochi in anticipation of a suitable donor. The donor was a 54 year old man, TT Joseph from Eloor Kochi, who succumbed to brain death in a road traffic accident. His eyes and liver was also donated by the family. He is survived by his wife Fransisca and 18 year old daughter Aleesha. The transplant was carried out in a marathon 15 hour operation by a team of 20 surgeons and 8 anesthetics, led by Dr Subramania Iyer and other leading surgeons in the team including Dr Mohit Sharma, Dr Sundeep Vijayaraghavan, Dr Kishore and Dr Jimmy Mathew. “Each hand required connecting two bones, two arteries, four veins and about 14 tendons. The immune suppressant drugs were started before the start of the surgery and continued after it,” said Dr Subramania Iyer. After the surgery, Abdul Rahim has progressed well and is fit to discharge hospital in a few days. He has regained a considerable amount of function in both his hands and using them for day to day activities. Abdul Rahim will need intensive physiotherapy for another 9 to 10 months. The first hand transplant at Amrita Hospital was was 3 months ago for 30 year old Manu who lost both his hands in a train accident. 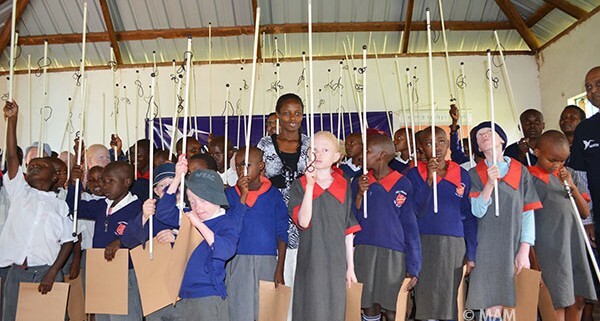 On April 11th, 2015, seventy blind children and youth from Thika Primary School of the visually impaired received white canes as part of AYUDHs ‘White C(r)ane Project’. 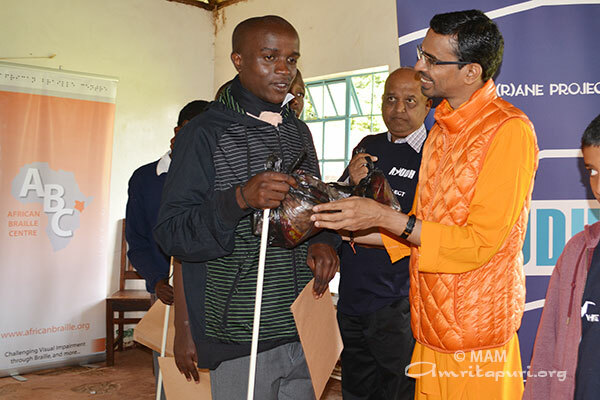 Initiated by blind AYUDH member Matthias, from Germany, youth across Europe had spent the past eight months raising funds to sponsor the project. As a representative of Embracing the World, Br. 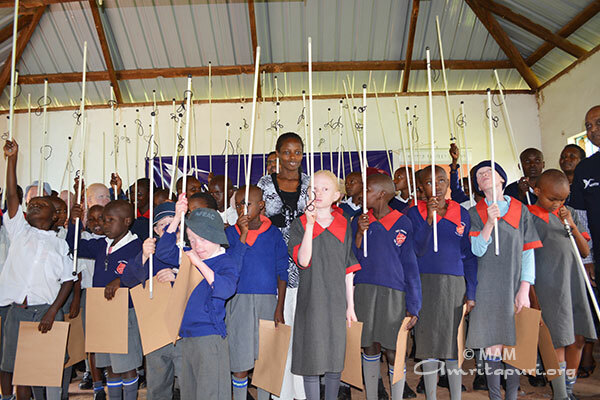 Shubamrita handed over the 70 canes during a special ceremony at the school, as the first phase of the Project. Speaking words of encouragement to the students, Shubamrita reminded the children that with an inspired inner vision and proper understanding of life, the children can reach the heights of success and happiness in life. He asked the children to pursue their dreams and ambitions, despite their physical challenges. 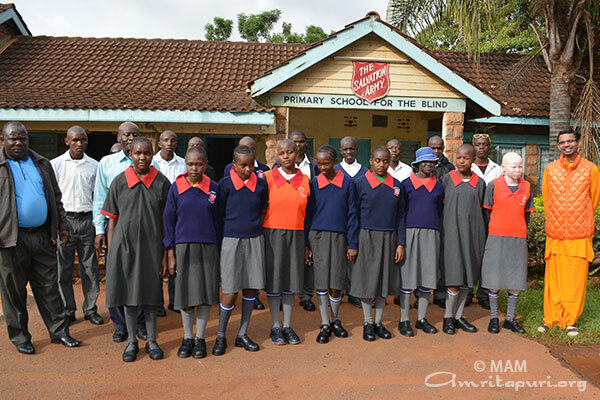 To advance the next phase of the project, Embracing the World volunteers will travel to the remaining schools for the blind in all of Kenya to look into the needs of children there and expand the project accordingly. 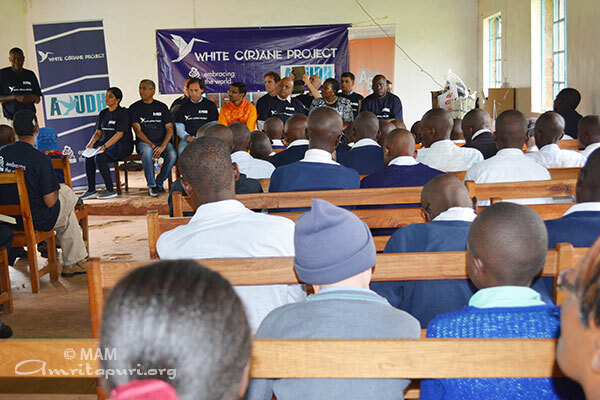 For days prior to the ceremony the blind children were composing and practicing a song, expressing their gratitude and appreciation towards Amma, founder and leader of the Embracing the World movement, as well as to the youth in Europe who showed their solidarity by raising the funds for the White C(r)ane Project. The song brought tears in the eyes of everybody present in the function. 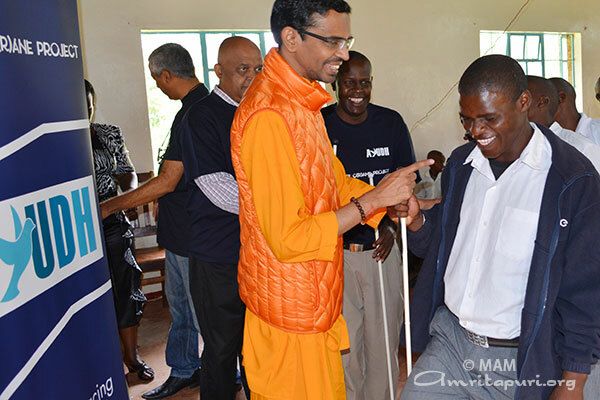 The fourth time Embracing the World teamed up with “Stop Blindness” and “Vision without Borders” to prevent blindness in Kenya. 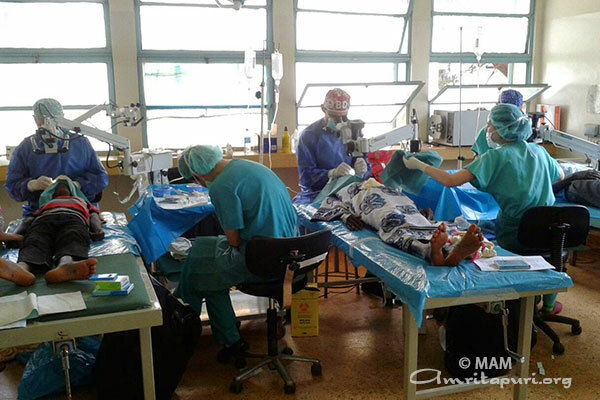 Led by Isabel Maria Signes Soler from Spain conducted 154 surgeries at the Busia Public Hospital between 10th to the 19th April 2015. Busia County is a rural area of Kenya, near to the border with Uganda. 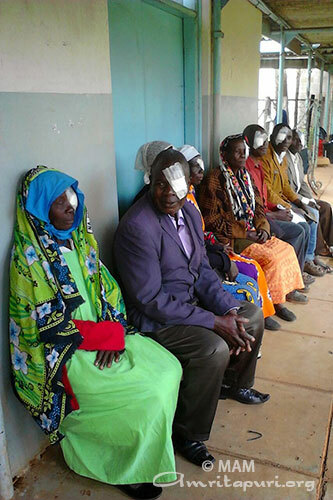 The prescreening had been done by local ophthalmic doctors who selected the patients with cataracts and other ambulatory procedures. It was The patients were extremely grateful to have received this free and comprehensive treatment. Most of the surgeries were to remove cataract, while some other eye problems were also treated, such as Pterigium and Conjunctival Melanoma. 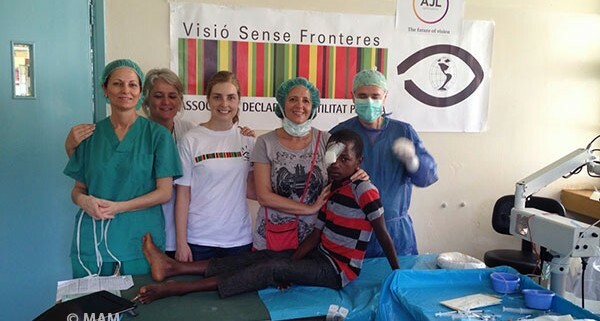 Young patients aged 9, 12 and 13 were also operated of traumatic cataracts. It was found that one of the widely spread conditions was uncorrected presbyopia, for which reading glasses were given to the patients free of charge. One old woman told the doctors that she had two children but they both died. Now she was living alone and had nobody to help her. It was proving to be very difficult for her as she could not see. Her vision was less than 10% in both eyes. 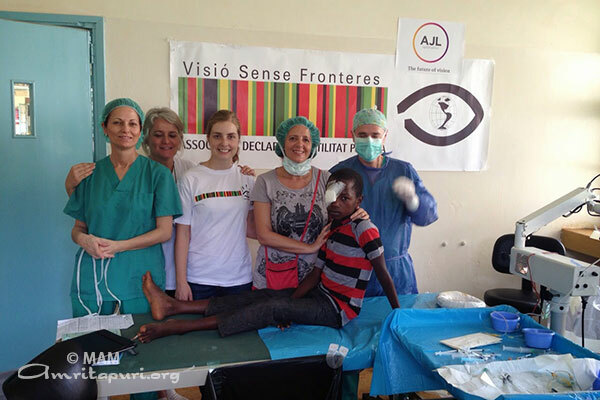 The team performed cataract surgery in both eyes. After the second surgery, she started dancing in joy right in the operation theater. Another woman was suffering from leprosy and could hardly walk. She was operated in both eyes and was very happy having regained her vision. Hon. Sospeter Odeke Ojaamong, the governor of Busia County, met with the doctors and expressed his heartfelt gratitude and appreciation for their hard work and dedication. The hearts of the beneficiaries were also filled with gratitude towards Amma and the medical team for the help they were receiving. 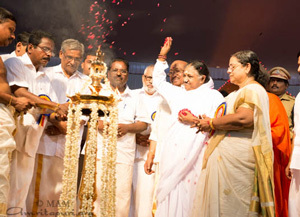 Amma inaugurated the Sri Narayana Darshanotsavam 2015 organised by SNDP union of Kunnathunadu. Amma was ceremoniously received at the venue. 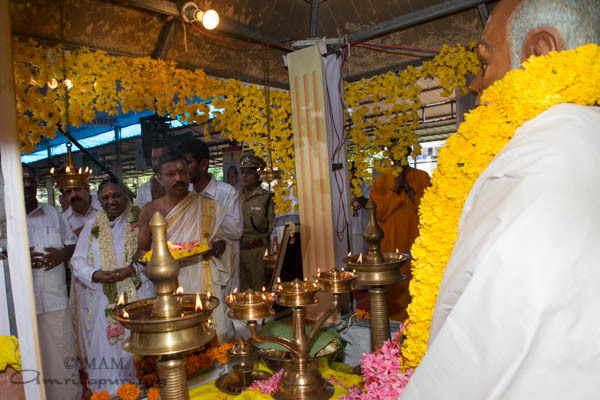 Amma visited the temple dedicated to Sri Narayana Guru, did arati there. 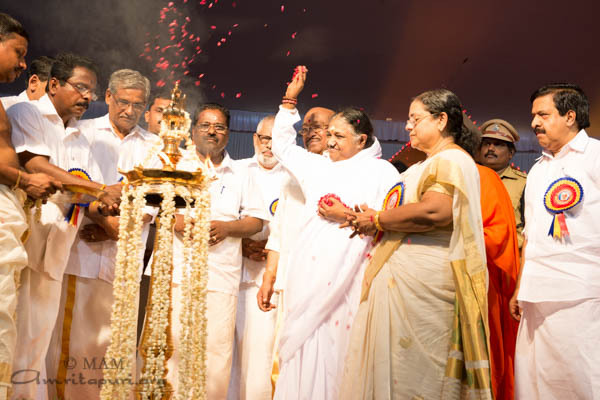 Amma shared the stage with Vellappily Natesan, SNDP Yogam Gen Secratary; Rameh Chennithala, Home Minister Kerala; KK Karnan, SNDP Union President; and P Balan Menon. 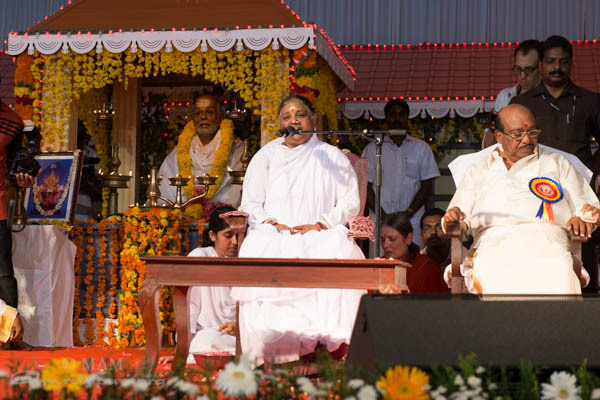 After the address, Amma lead all in meditation and a prayer for world peace. 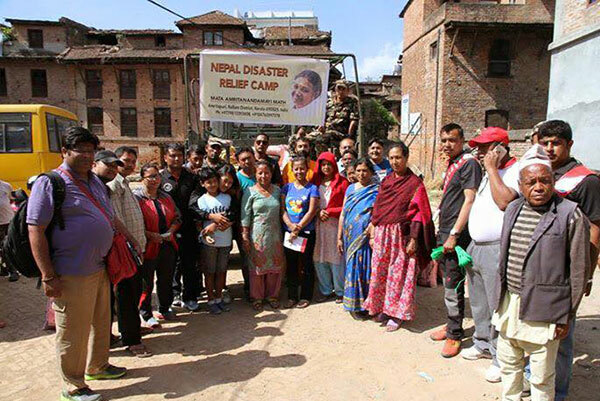 Direct by Amma, volunteers of Embracing the world is there in Nepal to help the earthquake victims in relief operations. 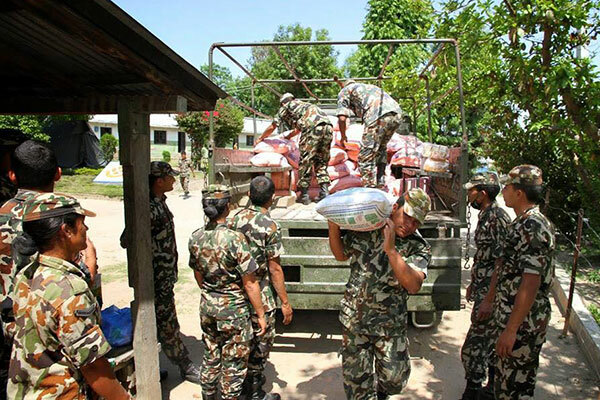 Along with the Nepal army two truck loads of rice, wheat, dal, oil, blanket and other items were distributed. 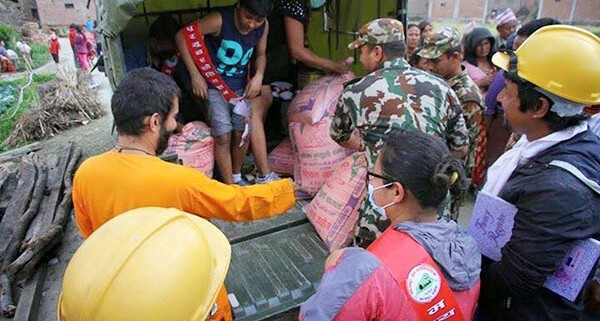 Earlier Amma had directed Embracing the World to send 50 tons of wheat, 2,000 sets of warm clothes and medicines to Kathmandu as immediate aid for survivors of the devastating earthquake. Read blogs from Nepal here. Waiting for Amma with open hearts…. Br. 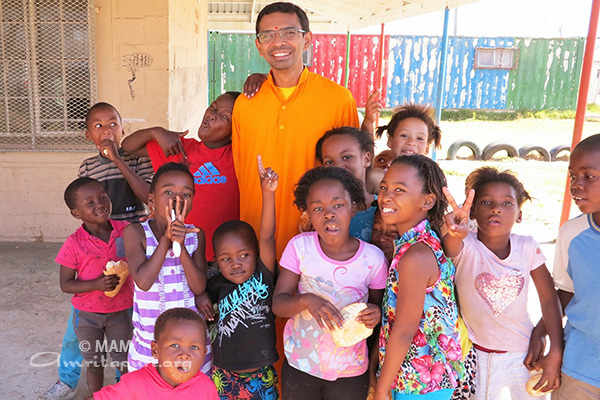 Shubamrita Chaitanya visited the Republic of South Africa for a series of programmes from April 6 to April 10, 2015. 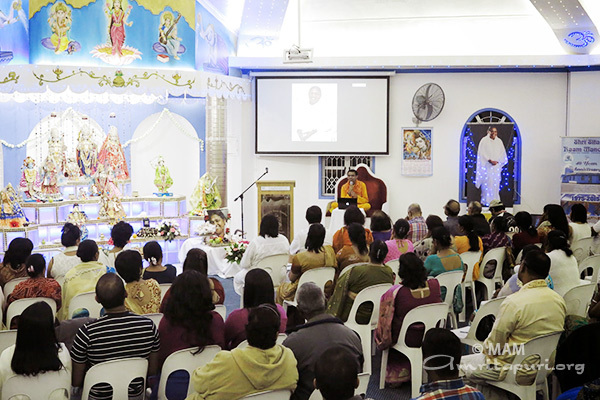 The programme in Durban on April 6 was held at the Sita Ram Mandir, and on April 7th at the Shri Sanathan Mandal in Stanger. Mrs Shameen Thakur Rajbansi, the Leader of the Minority Front and a member of Parliament in the KwaZulu Legislature attended the program in Stanger. During his stay in Durban, Shubamrita also called upon Mr. R. Raghunathan, the Consul General of India to South Africa, who evinced interest in the activities of Amma’s charitable organization, Embracing the World. Br. Shubamrita was also interviewed by the national TV station SABC 2, which was broadcast nationally. 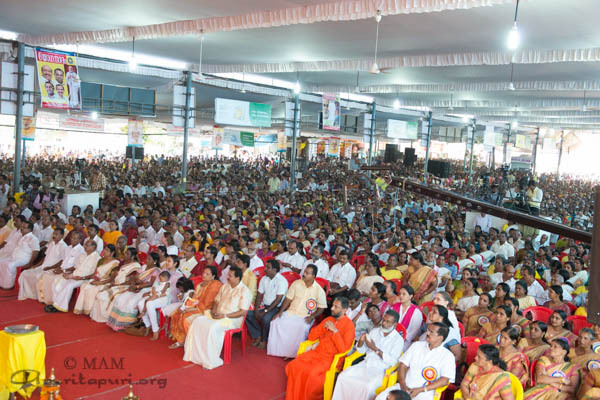 In both cities, the packed audience was keen on learning more about Amma’s life and teachings and wholeheartedly participated in the talks, soulful bhajans and meditations. 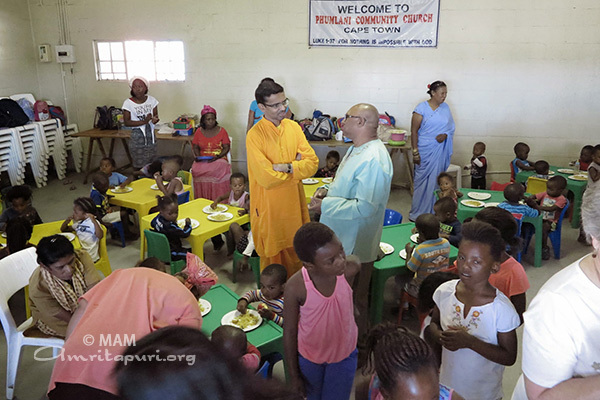 In Cape Town, Shubamrita conducted a feeding for disadvantaged children at the Phumlani Community Center, along with the devotees of the local temple Sri Siva Sakti Aalayam. Nourishing food was shared with the children, along with smiles and laughter. 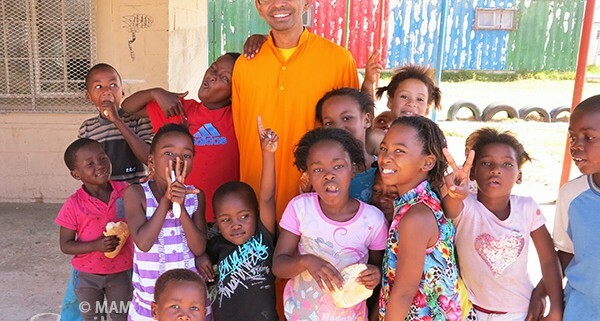 A public programme was held at the Novalis Ubuntu Institute in Cape Town on April 9th. It was a beautiful evening attended by members from all sections of society, giving due respect to the name of the venue – ‘Ubuntu’ describes the traditional African concept of the interconnectedness of humankind and very much correlates to Amma’s vision of unity and peace. Br. Shubamrita spoke on the topic, “Change Your Thinking, Transform Your Life,” which was greatly appreciated by the large audience. 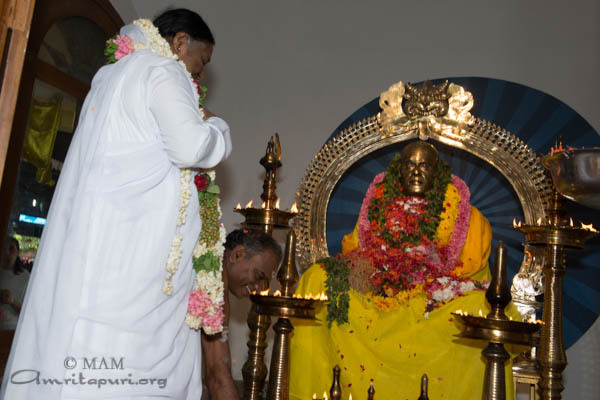 At every city, one question could be heard again and again: “When will Amma come and visit this beautiful country of South Africa?” Amma’s devotees of South Africa pray that this day will come soon and wait eagerly with open hearts.